Hokusai – Japanese painter, his best known work would be The Great Wave off Kanagawa. His passion for drawing began to develop as early as six, he was into drawing ever since. Also Thirty-six Views of Mount Fuji is his famous work which you can enjoy popular sightings in Edo Period (1603-1868). His perception of things and rendering is unique, he never fails you to be amazed. Cats are never exception! Hokusai was crazy about drawing and moving as well. He had moved 93 times (!) in his life. He and one of his daughter, Oei (O-i), who is also a painter, wanted to focus only on drawings and whenever their place got dirty, they moved. They didn’t really care about anything but drawing. He’d learned various methods of drawing hungrily beyond factions from early years, which often caused troubles. One of his disciples grumbled that he was not able to draw as he depicted in his head even for long years of practice under Hokusai. Oei laughed at this remark. Look at my father. He’s been drawing ever since he was a small kid to this day at the age of 80. 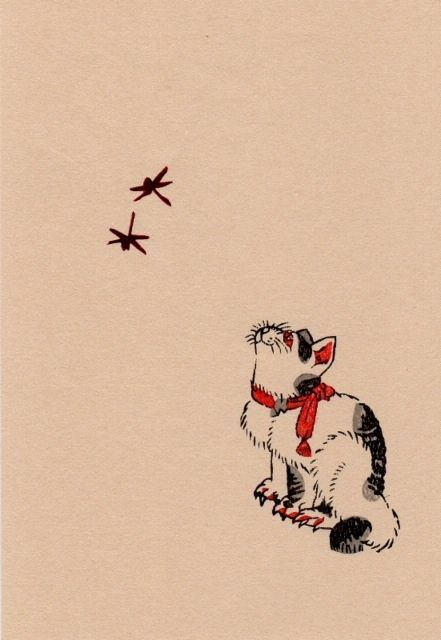 One day, he bit his lips and said he can’t even draw a cat in full command. In whatever you do, when you despair yourself for lacking desired skills, you would likely to see progress sometime soon. Said Oei, his father Hokusai nodded and agreed with the idea. Exactly! Hokusai never cooked himself. Every three meals in a day, he bought or had delivered to him. He had no plates, just a few tea cup, and tea pot. When they had a guest, they told a neighbor boy to serve tea for the guest. In such occasion, women were supposed to serve tea in a traditional manner, but his daughter O-ei never served tea for guests, either. She was not an ordinary woman. And she surely was a great painter just like his father. There was no fire-fighting hose or a fire extinguisher, a lot of building were burnt down in the Edo period. They are made of wood, a lot of people lived in tenement houses. Therefore, once the fire starts, it’s hard to distinguish. Despite the fact there was a lot of fire in Edo, Hokusai never experienced the fire until he was 75. He lost everything in this fire. He was totally disappointed by losing his accumulated drawing materials and stopped collecting ever since. However, his passion for drawing never ceased, it only grew as he got older. Just like Leonardo Da Vinci, Hokusai wanted to understand the mystery of life and render them on papers. He believed in order to draw thoroughly, one has to understand its structure. Otherwise, it doesn’t bring reality. He once was apprenticed to a bone-setter to master bone-setting and anatomy. Only after that, he said he could draw real human figure painting based on knowledge of the bone framework. Hokusai’s another great landscape series, A Tour of the Waterfalls of the Provinces depicts each province’s waterfall with his unique imagination. 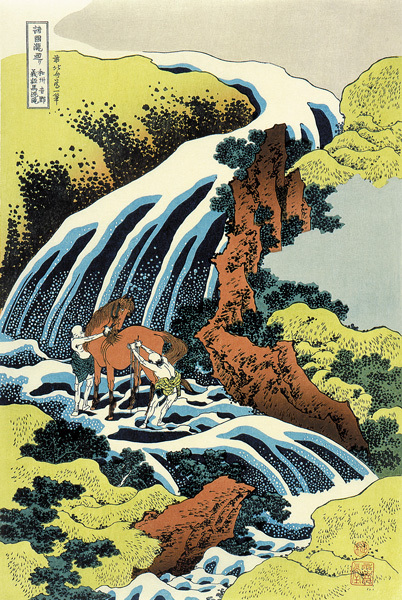 Hokusai expressed his Shintoist beliefs and being the first Ukiyo-e artist to approach the theme of falling water. Hokusai printed each waterfall differently, in order to emphasize the unique beauty of each site and to outline his belief that water was sacred. In Shinto, gods (deities) and spirits inhabit the surrounding nature, such as trees, rocks or animals in Japan. Hokusai used newly imported blue Prussian pigment which sometimes called as Hiroshige Blue as well, that was fashionable at that time. Here can call this blue Hokusai Blue for sure. 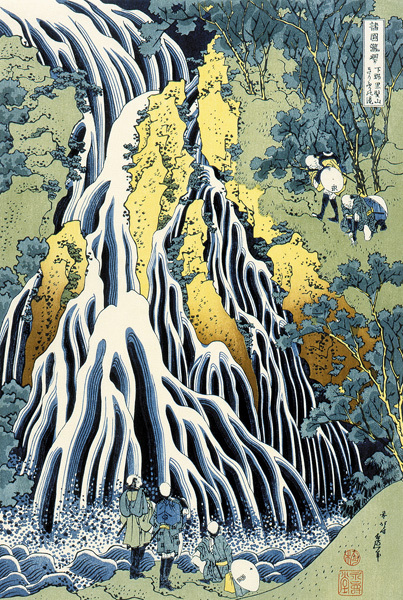 In this Waterfalls series, Hokusai uses more color, in order to highlight the new and main theme: the falling water. These waterfall prints are believed to be his finest work in the series, both technically and culturally speaking. Adding to the series’ cultural value is the religious subtext, the references to the original Shinto beliefs of Japan’s indigenous people. The followers of Shinto often practice rituals of purification under waterfalls and they aim to become like the water flow and be able to transcend all boundaries. 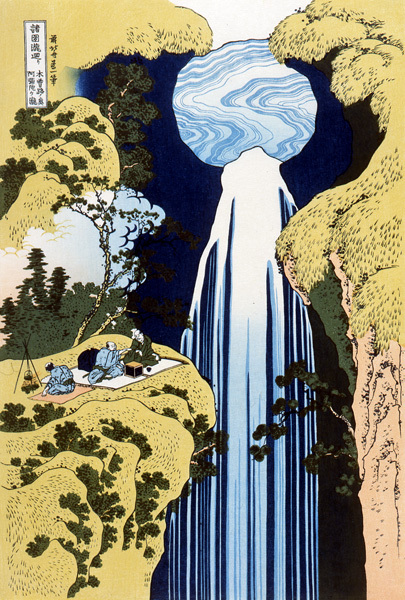 Again, Hokusai believed that water is sacred and waterfalls are able to purify and restore life. Hokusai’s most famous landscape series, Thirty-six Views of Mount Fuji, let people dream on an imaginable journey in Edo, the places even they had no chance to visit. Not just fantastic landscape prints, but Hokusai printed spirit of Fuji and people. A fisherman throws a net with consummate skill. It looks like as if he were producing the line of Mount Fuji. This　unintentional act of a fisherman and a boy helper look divine in this composition. The perception is to link casual moments to sacred ones, that’s what Hokusai intended. Straw hats and handy tissue are blowing by the strong wind. People are trying to stay strong so do Mount Fuji. This prints depicts its mutual similarity, but not something like mighty Fuji with complete composure and perturbed and vulnerable human . Hokusai depicted the figures both of Mount Fuji and people which do not flinch but stand on their own feet against the strong wind and in life. Five cranes on the lake and two are flying. Hokusai may have intended five cranes as holy spirit of Mount Fuji. Unlike today, cranes should be seen more often in various locations such as lakes and rice fields. And cranes must have seen as sign of gods. Unusual Views of Celebrated Bridges in the Provinces, this landscape series may not be the most famous ones, but they are remarkable prints, to say the least. Hokusai drew this bridge above with just imagination. There used to be an iris garden, but it’s gone by the time of Hokusai. He created this circuit style bridge to enjoy iris in his mind. This is a bridge which across the border of Hida and Ettsyu provinces. No handrail, yet the couple crossing it with no hustle. It might be their commute for business which they use all the time. Birds are flying over and under, deers are eating grasses on the hill. The bridge sags extremely under their weight, it’s an interesting mix of tension and a warm feel. Lines of people crossing the Tenman bridge who are visiting Tenjin festival. Japanese lantern of the bridge in order along with the arch make this print mystical. Lantern are on the boats as well, you can feel the bustling air with the excitement of people. Yet, again the comparison between lantern lights and the darkness is impressive. The bridge itself is a metaphor for connecting this side of the world and another. When one enter the sacred area, one has to purify and cleanse oneself. Only nobles were allowed to cross the arched bridge in shrines. Many stories with cutting bridge off and escape from the bad. Bridge metaphor is universal. Hokusai died at the age of 90. What could we have seen if he lived another 10 or even 5 years? 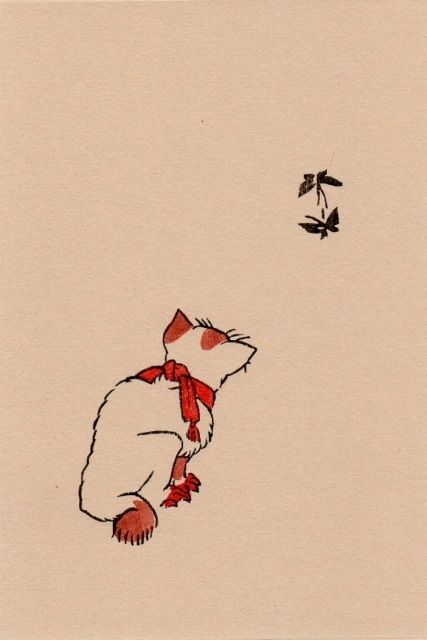 Still, we can enjoy his wild passion from drawings he left us. Of all others, Hokusai Manga shows you how everyday people live in Edo Period is quite amusing. In Hokusai Manga, he wanted to draw everything in the universe from animals and people, nature and architecture to ghosts. He also shows how to draw with the precise method. Hokusai suggested using circles as a guideline. You can feel a great sense of humor all through the pages. You can even see the daily life of ghosts ! His understanding of human structure, behaviors awesome and his imagination knew no limit. 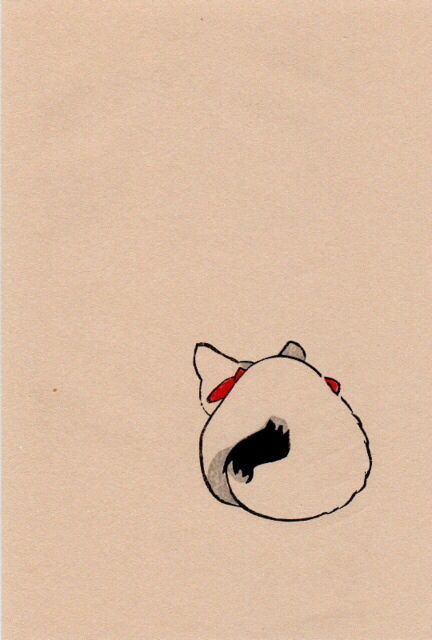 He captured funny moments, embarrassing moments, as well as joyous moments in his drawings. Feel the liveliness they exude! Everything becomes lively once you see from Hokusai’s perception . If heaven had granted me five more years, I could have become a real painter.